← When I Grow Old … . A rave about food: This is not a cooking blog. And I am clearly not a food photographer. If it was and I were, this picture would look a lot more appetizing. I don’t care. I sort of made up the recipe, it tastes delicious, and so I’m going to share. Lime Juice — I’m sure fresh is best for this too, but I never have fresh so I used the kind in the bottle. If you like a lot of lime, use a lot. If you don’t, use less. If you hate lime, you could probably leave it out altogether. Chicken Stock/Broth — I used a carton (4 cups) because I didn’t have fresh. Potatoes — Peeled and cubed. Mine were from my own plants (not that I’m bragging or anything). Ground Cayenne Pepper — 1/2 teaspoon sounded good to me. Sauté the onions and green peppers until tender. Meanwhile, mix corn and lime juice (and zest if you’re using fresh lime) in a medium-sized bowl. When onions and peppers are tender, add broth/stock, cumin, cayenne pepper and potatoes. Bring to a boil, reduce to simmer, and cook until potatoes are tender enough to mash. Mash the potatoes. Add corn and jalapeño, and heat through. If I wanted a thicker soup, this is when I would mix a couple tablespoons of flour and milk to form a paste, bring the soup to a boil again and gradually stir in flour/milk paste until the soup is thick enough to make me happy. Or I might cheat and stir in some instant mashed potatoes (definitely not fresh or from the garden, but it’s quick). You could add the milk all at once, but I plan to freeze some of the soup, so I’ll just stir in 3 tablespoons of milk into each cup before serving. You can use cream if you’re feeling particularly decadent. And if you want a more elegant presentation, chop some cilantro and use it as a garnish. I based this soup on a couple of recipes, most particularly a potato leek soup that we love. Here’s a link to that recipe: http://tinyurl.com/2sa9dd. There’s just nothing better than a big cup of thick soup with crusty bread and butter on a cool fall evening. It almost makes me glad the weather’s getting cooler. 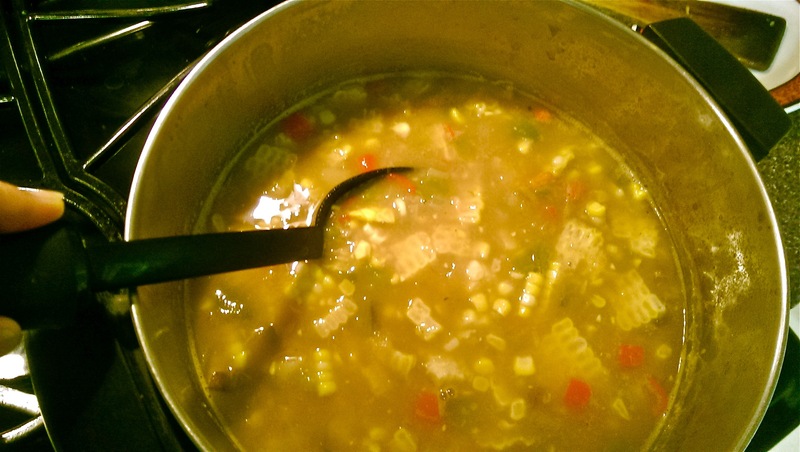 This entry was posted in Uncategorized and tagged Cooking, Corn Chowder, Corn soup, Delicious, Easy, Fresh Corn Soup, Potato leek soup, recipe, Soup. Bookmark the permalink.